As you might expect, Black Friday was filled with big crowds and long lines at pretty much every big name store. I did most of my shopping on Amazon. Just out of shear curiosity, me and my cousin decide to hit a few stores. First stop was Gamestop at around 11am. Pretty crowded but the lined moved rather timely. Next up was Toysrus. Place was like tornado hit it. It was just a big mess and the line was so long I decided to hold off what I intended to buy. Walked over to Best Buy and that place was even worse. Decided to head home and chill out a bit. Did some more online shopping and realized I missed a few presents. Hit up Gamestop and Toysrus again. Lines were long but they moved pretty well. Even the clerks who checked me out seemed to be friendly and up beat at the 8pm hour. 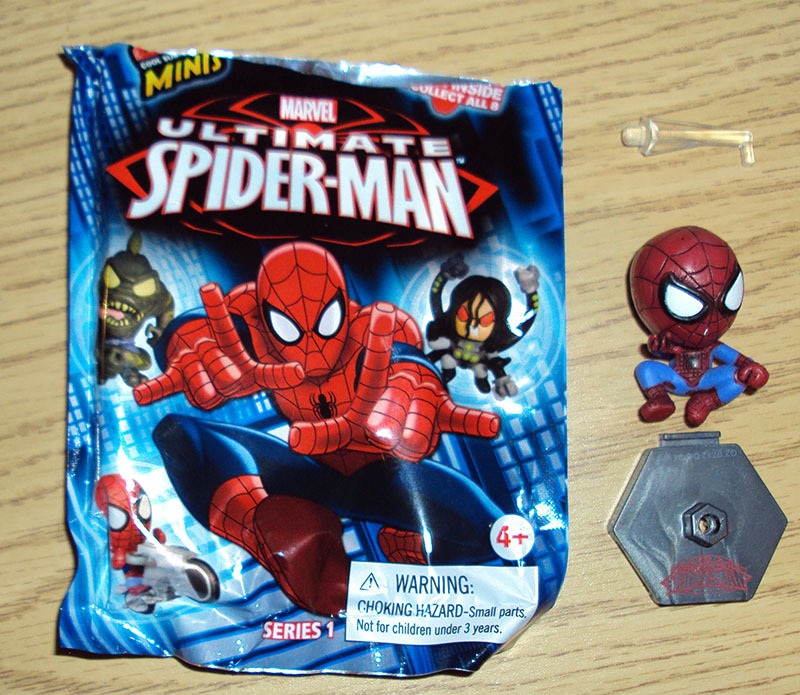 While I was in line at Toysrus, I spotted these little 1″ Grab Zag Minis Ultimate Spider-Man blind pack figures. They looked pretty good from the product shots on the packaging and are priced at $2.99. Because they are blinded pack figures its difficult to know what you’re getting. The figure inside is actually sandwiched with 2 cardboard sheets to make it a bit difficult to feel up the bag for the figure you want. 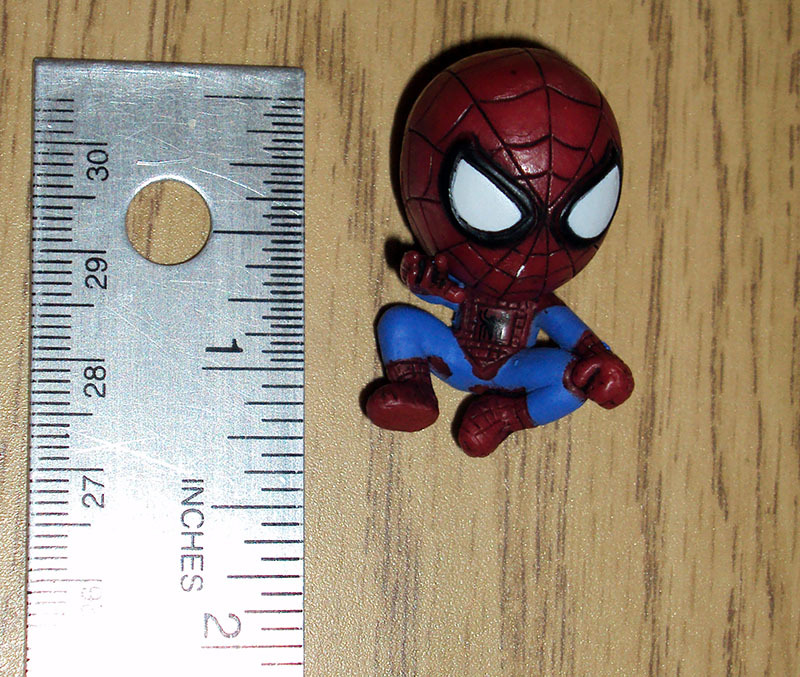 As mentioned, the figure stands about 1″ tall. The figure comes with a deep gray stand with a clear plastic poll. One end pegs into the stand and the other into the back of the figure. I especially like the official Ultimate Spider-Man logo on the stand. The figure is sculpted very nicely, reminds of the Japanese Super-Deformed cartoon style. The paint apps are a bit messy but what do you expect for something so small. I like the fact the web are black panel-lined. 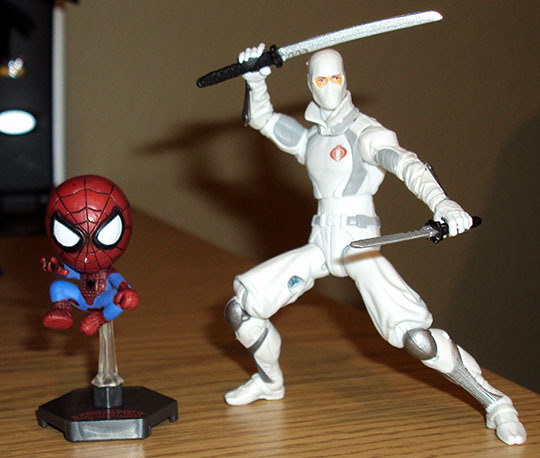 Next to my G.I.Joe Storm Shadow, you can really get sense of scale. It’s an awesome little figure, perfect next to a computer monitor. I just might pick up a few more.